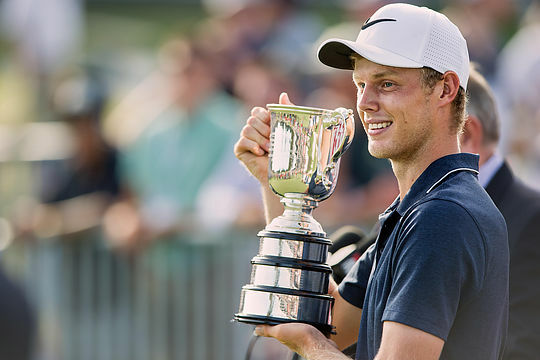 Former Australian Open champion Cameron Davis is back for another year while some exciting new names have been added to the squad to receive the backing of Golf Australia as they ply their trade around the world this year. Australasian Order of Merit winner Jake McLeod has been named in the 12-man squad, as has Japan Tour up-and-comer Anthony Quayle. In all there were six new names and six who will continue to receive the support which can be so vital as they take those tentative steps taking on some of the best players in the world. The six named from last year’s squad were Brett Coletta, Karis Davidson, Cameron Davis, Hannah Green, Lucas Herbert and Travis Smyth – all showing some class and talent on their respective tours and paths towards success. Golf Australia high performance general manager Brad James named six new faces as well following some encouraging performances in recent months. The list included three ‘newly-minted’ pros who’ve come through state-based high-performance programs in Min Woo Lee, Zach Murray and Dylan Perry, while Queenslander Robyn Choi opted out of the University of Colorado when she won LPGA Tour playing rights at Q-school in December. James said irrespective of their pathways to this point, he was confident the 2019 squad would continue their stellar progress on international stages, with many having already taken large strides. “We have been delighted with the results previous members of the rookie squad have produced in years past and we believe those results have been made easier to achieve by the support the program affords them,” he said. All 12 receive reimbursed funding towards the investment they make in expanding their career through training, preparation, travel and competition. Robyn Choi (1st year), Brett Coletta (3rd year), Karis Davidson (2nd year), Cam Davis (3rd year), Hannah Green (3rd year), Lucas Herbert (2nd year), Min Woo Lee (1st year), Jake McLeod (1st year), Zach Murray (1st year), Dylan Perry (1st year), Anthony Quayle (1st year), Travis Smyth (2nd year).